This is a fun project for 18 inch dolls such as American Girl or Magic Attic. Since this is a bag, and not technically an item of clothing, it will fit just as well with either body type. 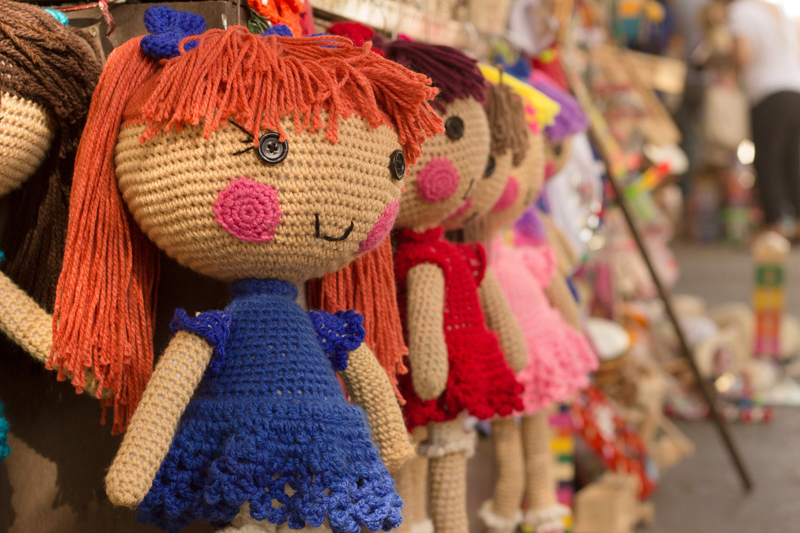 The bag requires a minimum of time and materials to make; an hour or two and some leftover yarn will give you a cute addition to your doll's wardrobe, or a nice little gift for a friend who likes dolls. In the photo at right, my Magic Attic doll, Rose, shows off her new bag. A small amount of yarn, I used acrylic baby sport yarn that I had left over after making a baby sweater. Size G or 4.25mm crochet hook. Needle and thread to attach the button. To begin at bottom of front flap, chain 5. 2 SC in first SC, SC in next SC, 2 SC in last SC. 2 SC in first SC. SC in next 3 SC. 2 SC in last SC. Repeat this row until there are 11 SC in the row. Work even for 7 rows, at end of last row, CH 3 and turn. DC across, CH 1 and turn. This forms the top of the bag where the flap fold over the front. SC across. There should still be 11 stitches in each row. Work even, in SC for 17 rows. Bind off, leaving a long tail of yarn to sew bag together. To make the strap, CH 7, SC in second chain from hook and in remaining 4 chains, 5 SC in the row. Work even in SC rows until the strap is 18 inches long and bind off. You should now have 2 pieces that look like the photo at right. Sew the pieces together, with the ends of the strap forming the sides of the bag. Stop sewing the back of the bag to the strap when you reach the DC row, on both sides. Sew the pretty button to the front flap and enjoy! Ebook with patterns and instructions to make 5 cloth dolls as well as chapters on general doll making techniques.The book includes 21 inch Lalena Doll, 21 inch David Doll, Bear Dolls, 9 inch Destiny Doll and 15 inch Annie Doll, all together in one handy book. 53 pages.Making and Dressing Cloth Dolls. Content copyright © 2018 by Helen B. Wharton. All rights reserved. This content was written by Helen B. Wharton. If you wish to use this content in any manner, you need written permission. Contact Helen B. Wharton for details. Come join us in the Doll Making Forum with your questions and comments! Subscribe for free weekly updates from this Doll Making site.